Dust in the Wind by Kansas is a truly great fingerpicking guitar song, from an era when music stars were real musicians. It is one of those songs that you'll be playing for many years to come, as it never gets boring. Now the song may seem difficult when listening to it, but I promise you it's not. Once you know the chords and the picking pattern, you'll be all set. Our Dust in the Wind video guitar tutorial starts off by introducing you to the main chords you'll need to know to play the song. Once you know the chords, you'll learn the strumming version of the song as well, which not only sounds great, but is also useful for practicing the chord progression and learning those chord changes. Make sure you download and print the tabs as well, since you'll find the exact chords to Dust in the Wind, which you'll be able to use when you're practicing on your own. 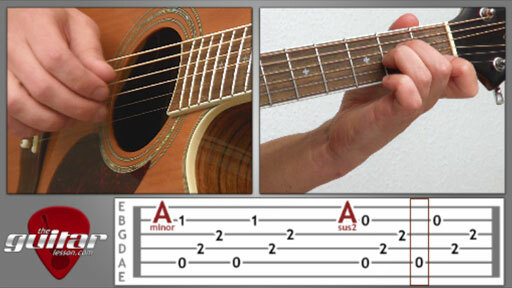 Once you know the chords, you'll learn the fingerpicking pattern. Learn it well, as it repeats all through-out the song. After the picking pattern, you'll learn to play all of Dust in the Wind on your guitar, including the intro, verse, chorus, as well as the interlude they play during the violin solo. Dust in the Wind was released by the American rock band Kansas in 1977 on their album Point of Know Return. It was one of the band's first acoustic tracks, its slower paced melody, acoustic dominance and melancholic lyrics make it unique in their discography. The guitar part is originally played by two guitarists simultaneously, one in standard tuning and the other in Nashville tuning. This creates a lively, chimy sound similar to a twelve string guitar. The song's interlude features a distinctive melodic line played on violin. Dust in the Wind is Kansas' most successful composition, and was used in several TV shows, including Desperate Housewifes, The Simpsons, American Idol, Family Guy, etc. It was also covered by dozens of artists as well. Sorry, but you've reached a premium content area. The download of the Dust in the Wind tablature file is only available to premium members. To download this song's tabs, please log in and revisit this page, after which the file will become available for download. Sorry, the same goes for the backing track. To download the backing track to Dust in the Wind, please log in and revisit this page.